We have all ordered flies online before, only to be dissappinted on their arrival with the crushed box with the retailers catalogue wrapped around the flies with flies are wedged together often damaged before we even get to use them. We considered packaging as crucial to the provision of a quality service. We went to many different box suppliers before deciding upon the ideal method of delivering flies. Our flies are packaged either in zip lock bags for lures and wet flies or on cards for salmon flies or in individual boxes for hackled or dry flies. Our small boxes are designed to perfectly protect your investment in dry flies or other flies with fine hackles. The lure and wet fly bags protect your wet fly wings and restrict movement to protect the flies further. We designed boxes to fit our dry flies, we came up with a boxes within boxes concept, absolutely crucial for dry flies. Our Internal boxes are designed to fit perfectly within our postage boxes. Indeed if you order many dry flies from us you will find no better way of protecting the flies. The internal boxes strengthen further the postage boxes. Testing has shown that you wil lhave great difficulty damaging the internal boxes as the box within box concept provide further re-enforcement for each other. We found extremely strong but light corrugated cardboard packaging which we could assemble rapidly that would protect the flies from damage in our postal system. 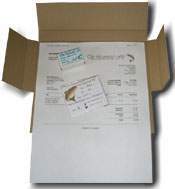 These boxes fit exactly on the current 25mm postage limits for large envelopes. This means that we can send the maximum number of flies and still get them through your letterbox with minimum postage costs.